I just brought up my 2nd SIMH VAX - a VAX-11/780 named CLOUDY with a DECnet address of 1.551. 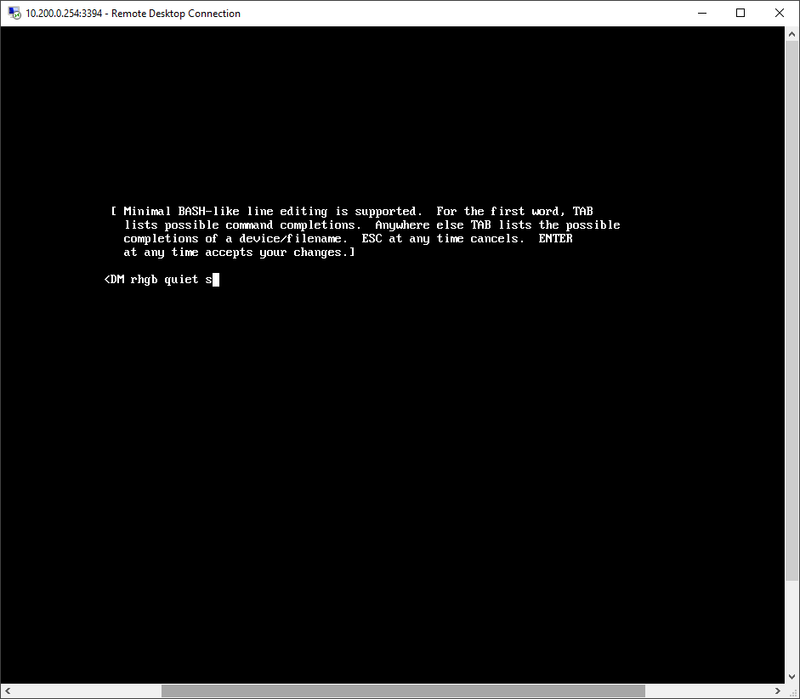 I installed BASIC, C, C++, COBOL, FORTRAN and PASCAL compilers on it one by one, and tested each with a little "Hello, World" derivative. There is a free public guest account on CLOUDY VAX if you want to write programs in any of these languages. To get to it, telnet to my oldest VAX - a VAXserver 3900 at sanyalnet-openvms-vax.freeddns.org, login to guest account (password is in the SYS$WELCOME banner), and choose the option to SET HOST CLOUDY. You can then login to the guest account on CLOUDY the same way. 10 PRINT " OpenVMS (TM) VAX Version V7.3 Major version id = 1 Minor version id = 0"
DISPLAY ' OpenVMS (TM) VAX Version V7.3 Major version id = 1 Minor version id = 0'. Here are the sizes of the executables produced by the different compiler and linker invocations. BASIC and FORTRAN came in with the biggest EXE sizes, while C and Pascal EXEs are the smallest. COBOL and C++ executables are in the middle in terms of executable sizes. I was a bit surprised since I was expecting C++ to come in the biggest. Total of 6 files, 30 blocks. You can download all of these source, object and executable files along with source listings including machine code and link map files with cross-reference from my google drive. Like owners of every internet-facing DEC VAX server running Digital OpenVMS operating system accessible publicly via the Telnet port (TCP port 23), my pet SIMH VAXserver 3900 "QCOCAL" and SIMH VAX-11/780 "CLOUDY" are inundated with dictionary-based breaking attempts all the time from across the world. You can get a feel of the sheer volume of these attacks from a report I publish daily, generated by a DCL command procedure batch job, summarizing brute-force intrusion attempts at QCOCAL from the OpenVMS system using "ANALYZE/AUDIT/EVENT=(BREAKIN,LOGFAIL)/SINCE=-7-00:00:00 SYS$MANAGER:SECURITY.AUDIT$JOURNAL /output=dua2:[fal$server]intrusions.txt". This summary report is available publicly on the internet, served by WASD httpd web-server running on OpenVMS VAX 7.3, at the URL http://sanyalnet-openvms-vax.freeddns.org:82/falserver/intrusions.txt. The telnet port intrusion malware problem has recently been exacerbated by the successful Mirai botnet which targets the IoT (Internet of Things ), looking for and installing itself in a mind-boggling number of devices like cameras, smart televisions, routers, switches and other internet-connected consumer and professional devices. The publication of the source code for Mirai has assured public server operators of similar and smarter derivatives continuing to challenge our servers. I publish a frequently-updated publicly available block-list of Mirai (and family) infected IP addresses that my systems are seeing actual brute force break-in attempts from. 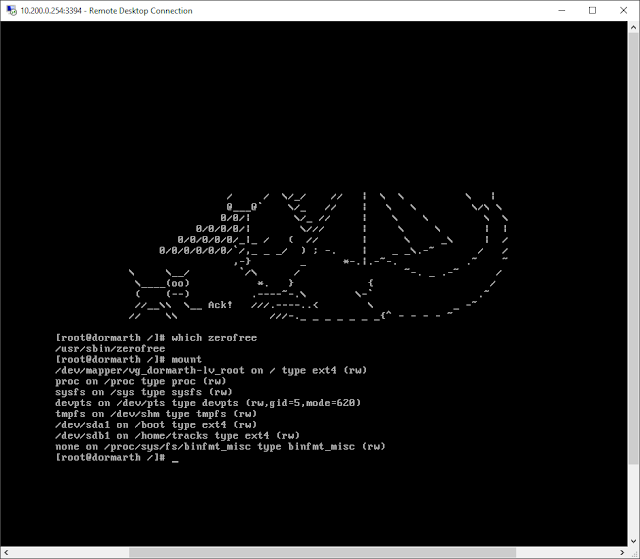 I use snort IDS/IPS software running on the 2nd of my 3-layer firewall for this. The URL of my Mirai blocklist is http://sanyalnet-cloud-vps.freeddns.org/mirai-ips.txt - feel free to implement a scheduled download of this file to your firewall. However, the sheer number of sources of attack makes my attempts at denying access to servers based on just a dynamically-updated blacklist of little consequence. I needed something additional, and also wanted to report OpenVMS Telnet port 23 intrusion attempts to the blocklist.de service so that the ISPs of the offenders get notified of abuse, and the numerous users of the blocklist.de list also benefit. In this post, I describe the rather obtuse way I achieved the goal of passing on intrusion information from OpenVMS logs to blocklist.de using the fail2ban tool running on a Linux intermediary. You can take a look at the results here. One of the things I use my VPS sanyalnet-cloud-vps.freeddns.org located in a data center in Ontario, Canada for is as a central syslog repository which receives and logs entries from most of SANYALnet systems. I get around the issue of clear-text log transmission to the VPS over the internet by using a stunnel secure ssl tunnel at the endpoints. The local rsyslog and syslog-ng loggers forward logs to local stunnel endpoints. 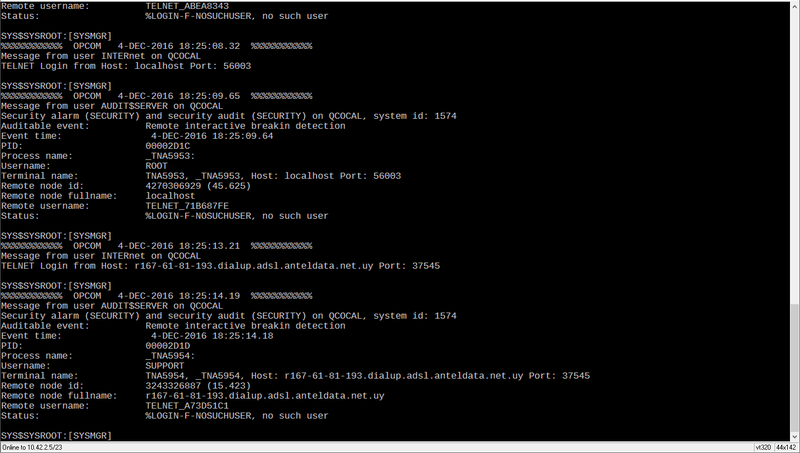 stunnel encrypts and transports them to the remote stunnel endpoint running on the remote VPS. 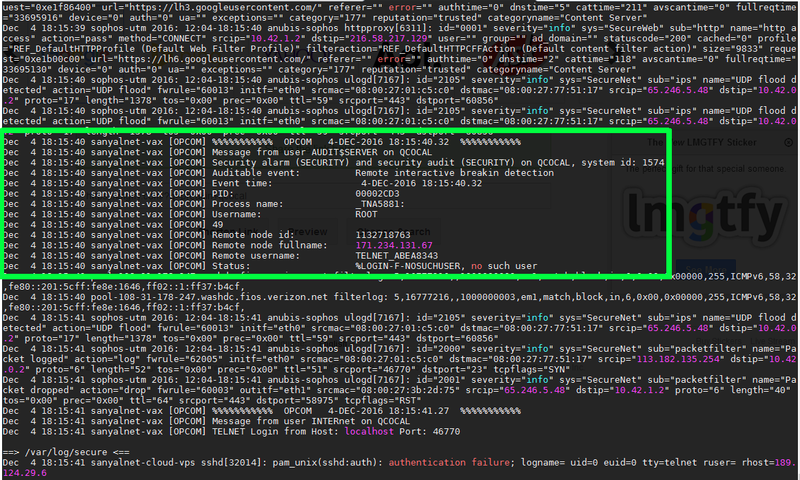 The remote stunnel endpoint decrypts the log entries and sends them to the rsyslog daemon running locally on the same remote VPS. For local servers that run the classic syslog daemon which is incapable of using ports other than the default syslog port (514), I point them to another rsyslog daemon running on a different node dormarth.sanyalnet.lan on the local LAN, which forwards them encrypted over stunnel to the remote unix-style syslog daemon on the VPS. 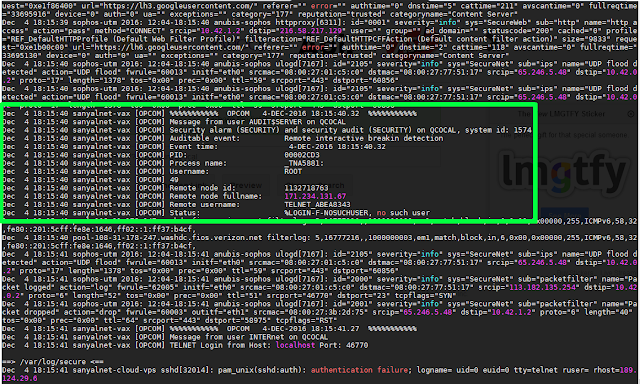 Since stunnel works only for TCP logging, the same rsyslog daemon on the intermediate dormarth.sanyalnet.lan Linux box serves as a UDP syslog sink for UDP-only clients, whose logs are forwarded encrypted over stunnel to the remote cloud VPS. I use a similar mechanism to forward OpenVMS logs to the central syslog server running on the remote VPS with dormarth.sanyalnet.lan as the intermediary. The flow of log data is OpenVMS OPERATOR LOG > OpenVMS SYSLOGD.EXE > dormarth.sanyalnet.lan > stunnel encryption > sanyalnet-cloud-vps.freeddns.org > stunnel decryption > rsyslog daemon. You can learn more about how I have set this up in my blog entry "Secure Remote Logging to Central Log Server Using RSYSLOG on CentOS 6 / CentOS 7 and stunnel". 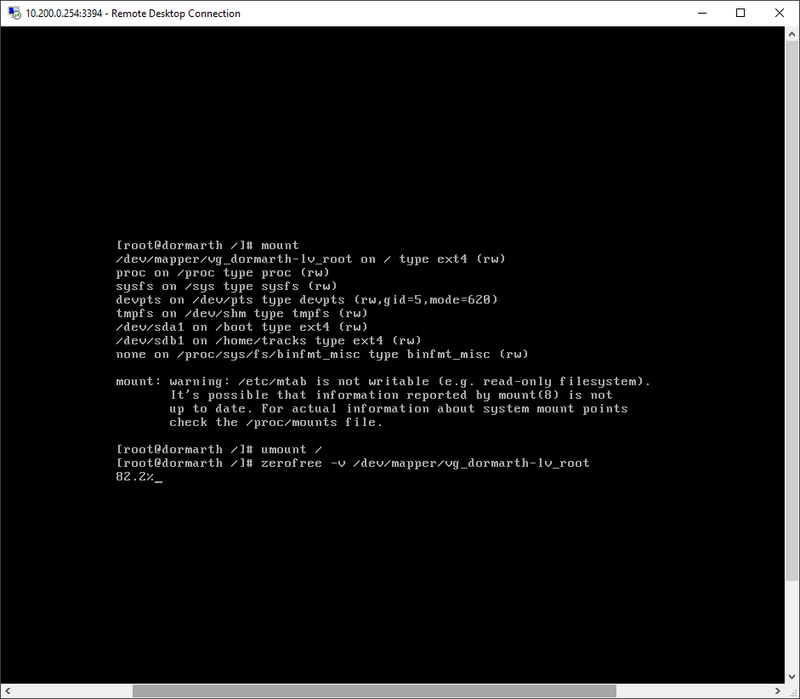 I slightly-modified the OpenVMS SYSLOG.EXE program by Doug O'Neal from Homewood Academic Computing at Johns Hopkins University to support a configurable port number. This modified SYSLOG.EXE runs on my OpenVMS VAX system QCOCAL, forwarding OPERATOR.LOG entries at real-time to dormarth.sanyalnet.lan, which in turn stunnels them to the remote VPS. The important thing to note for the purposes of this article is the OpenVMS logs are, therefore, recorded by two syslog daemons - one at dormarth.sanyalnet.lan inside the local LAN, and the other at the remote sanyalnet-cloud-vps.freeddns.org VPS. I have described OpenVMS to Unix-Style SYSLOG logging in detail in my blog entry "OpenVMS Log Files Remote Logging to Unix/Linux SYSLOG Facility RSYSLOG". Since I already have fail2ban configured on dormarth.sanyalnet.lan, the PAM auth failure entries logged by the bash script are picked up by fail2ban and reported straightaway to blocklist.de. This is ultimately what results in the public recording of the intrusion attempts warning others of the attack source, like you see on the internet abuse IP databases. Dec 12 05:59:32 dormarth sshd[000010F1]: pam_unix(sshd:auth): authentication failure; logname=SYS$MANAGER:OPERATOR.LOG uid=0 euid=0 tty=TELNET_50EE4387:49926 ruser=ADMIN rhost=80.238.67.135 user=TELNET_50EE4387 rport=49926 time="12-DEC-2016 05:29:23.07 UTC" event="80-238-67-135.internetia.net.pl;%LOGIN-F-NOSUCHUSER, no such user;Auditable event: Remote interactive breakin detection" reporter="Digital-VAXserver-3900-OpenVMS-7.3;DECnet:QCOCAL(1.550);inet:http://sanyalnet-openvms-vax.freeddns.org:82/"
and here is the /etc/cron.d/openvms-telnet-spam-blocklist-update cron file (remember, it must not have write permissions for group and world, i.e. permissions on this file should be -rw-r--r-- ). It is to be noted here that my logrotate.conf file limits the system log to two days of retention, thus automatically limiting the flagged IP addresses to 2 days. And also fail2ban does not re-ban IPs that are already banned, thus avoiding duplicate notifications to blocklist.de within 48-hour periods, which is the default duration of blocklist.de blacklisted IP addresses. 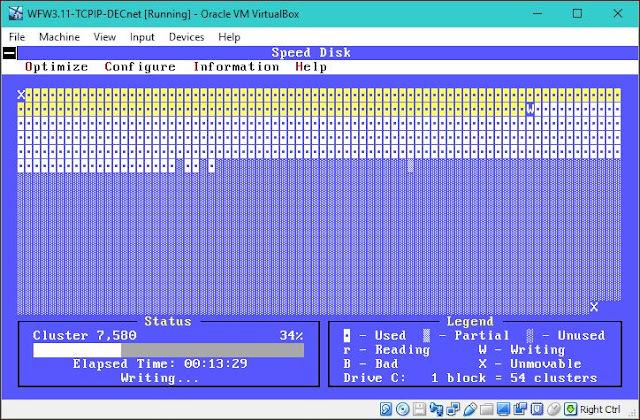 Before taking backups of my hobbyist and production virtual machines, I follow the popular recommendation of zeroing out all unused free virtual hard drive space and compacting them using the virtual disk compacting tool that comes with Oracle Virtualbox. Download: All the tools, utilities and scripts described in this post are available for direct download from my google drive. To zero out unused disk space on my virtual hard disks on Linux virtual appliances, I use Ron Yorston's nice "zerofree" tool. Connecting to frippery.org (frippery.org)|93.93.131.127|:80... connected. zerofree works only with inactive partitions that are not mounted (it correctly refuses to manipulate mounted active read-write partitions). We need to boot into single-user mode and dismount the partitions one by one, running zerofree on each. To boot into single-user mode, I edit the grub boot command line to add a "s" at the end. To do this, I reboot the virtual machine, and when it comes back to the grub menu, I press "e" to edit. 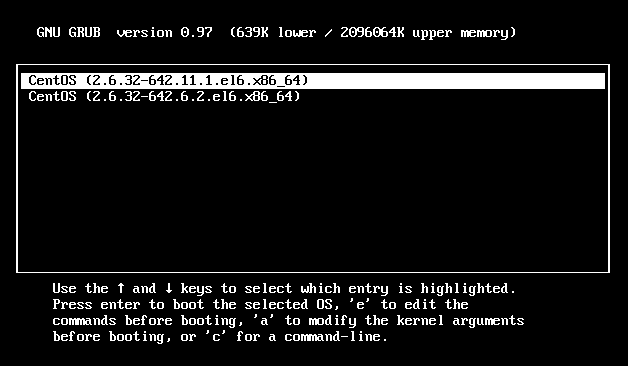 Note: I am using a CentOS release 6.8 Linux virtual machine (kernel 2.6.32-642.11.1.el6.x86_64) for this walk-through. 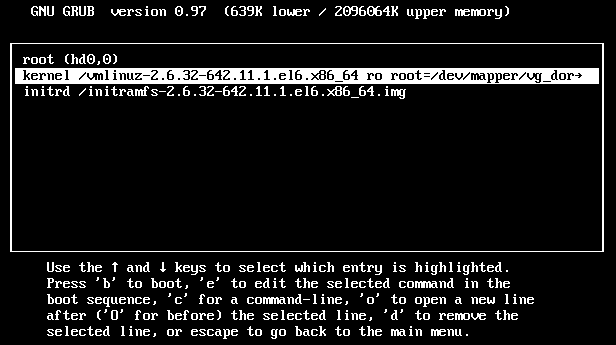 On the next screen, I choose the "kernel" line by pressing the down arrow, and press "e" again to edit the kernel boot parameters line. In the minimal line editor that opens up, I add a "s" at the end of the existing line, after "quiet", for single-user boot. Pressing Enter after adding the "s" at the end brings me back to the boot screen, where I can now press "b" to boot into single-user. The computer boots up into single-user, and drops me into a root shell. 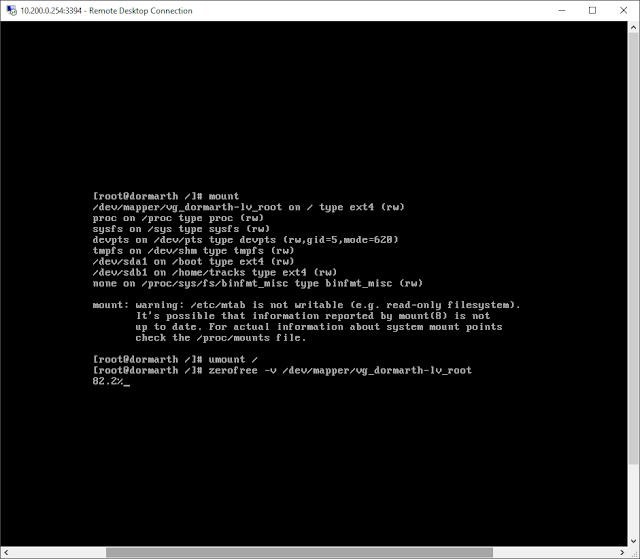 I type in the "mount" command to look at the mount-points to identify the partitions to run zerofree on. In this case, there are two disk drives. 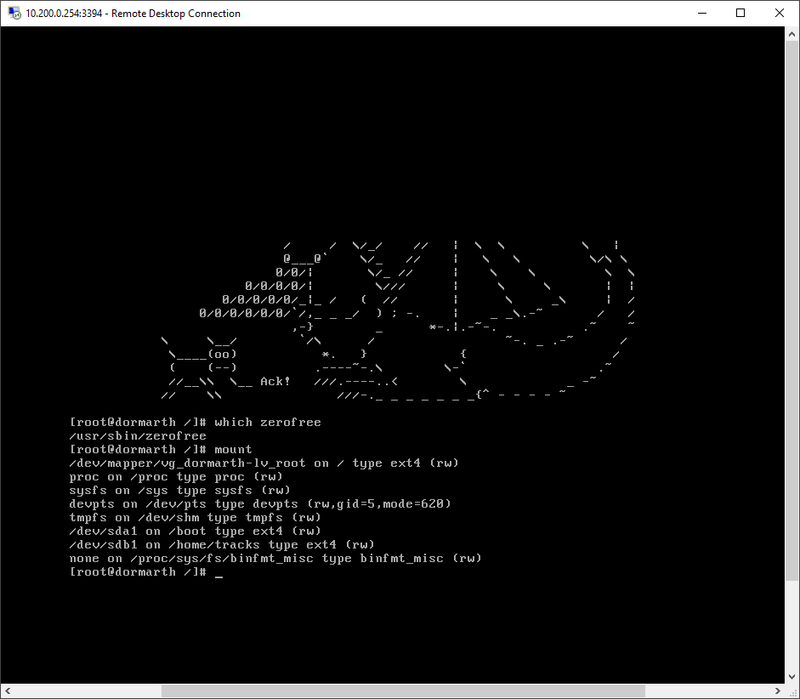 The first disk, sda, has the logical volume managed (LVM) ext4 file-system "/dev/mapper/vg_dormarth-lv_root" mounted on "/", and the ext4 partition /dev/sda1 mouted at file-system "/boot" . The second disk, sdb, has the /dev/sdb1 partition mounted as the ext4 file-system at /home/tracks. The halt command should power the VM appliance off (if it does not, use VirtualBox to power it off). The next step is to invoke the Virtualbox manager to compact (shrink) the virtual disk as described below in section 4. 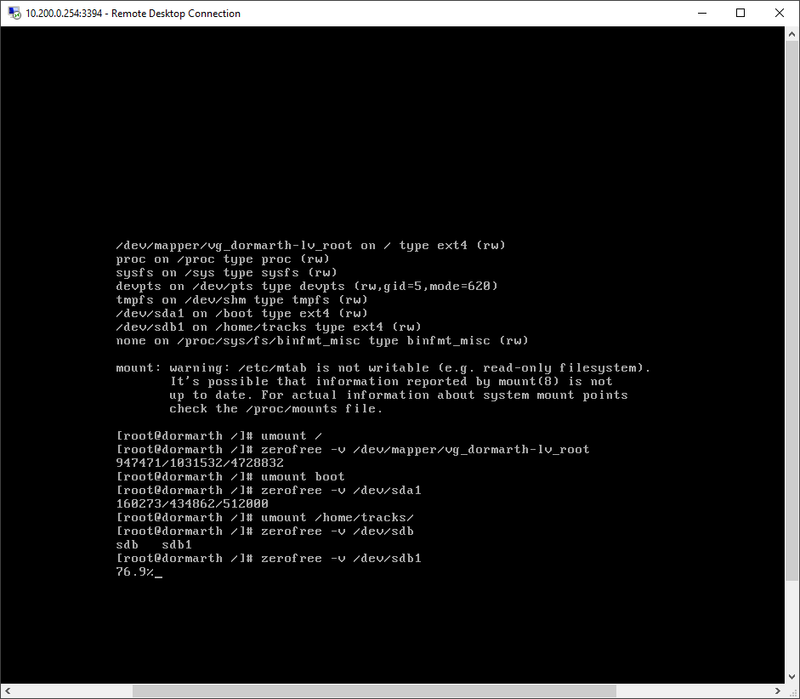 On my Solaris 11 openindiana virtual machine (http://sanyal.duckdns.org:81), I use this script which invokes gnu dd to create big files filled with zeroes and deletes them, leaving zeroes on the virtual hard disk. I then shutdown and poweroff the Solaris 11 openindiana VM and use Virtualbox manager to compact (shrink) the virtual disk as described below in section 4. 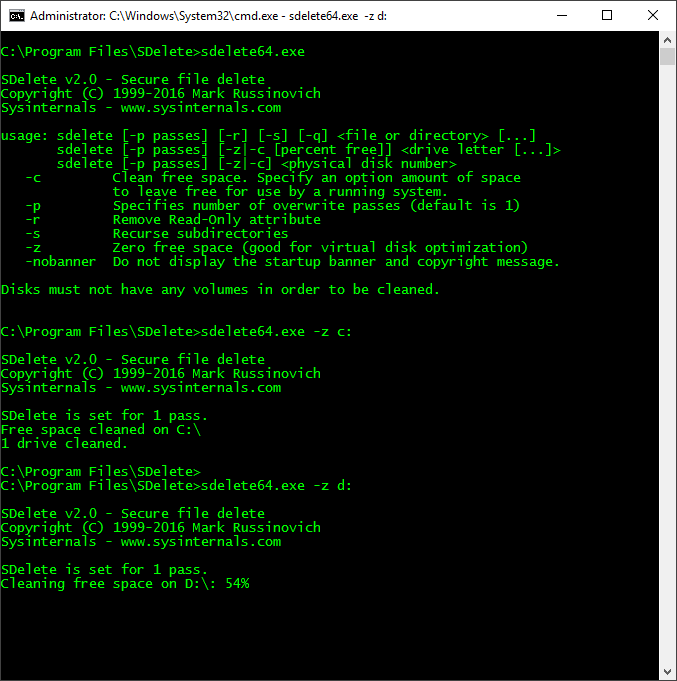 To write zeroes to unused disk space on Windows, I use the SDELETE.EXE command line tool available for free from Microsoft. You can download the SDELETE.EXE tool by itself, or grab the entire Sysinternals Suite which is a collection of great utilities. But before zeroing out unused space on a Windows NTFS file-system, I try to free up as much space as I can and defragment/optimize the NTFS partitions, so that the effect of zeroing out empty space is maximized. 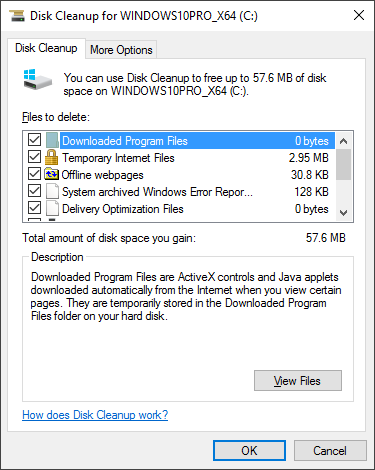 I first run the "Disk Cleanup" tool that comes with Windows, choosing the "Cleanup System Files" option that clears up unneeded files freeing up the maximum space. 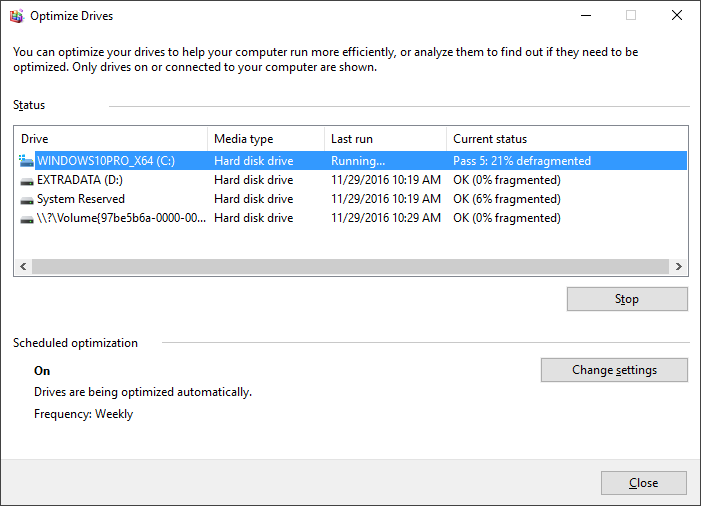 Then I run Microsoft's "Optimize Drive" tool that is also included in Windows to defragment my NTFS partition. This tool (at least on Windows 10) is intelligent in handling SSD drives if you have any (I do not). It makes multiple passes on each NTFS partition you choose, relocating, defragmenting and consolidating in each pass and takes a while. Make sure you defragment all your virtual NTFS drives (C: and D: in this example). 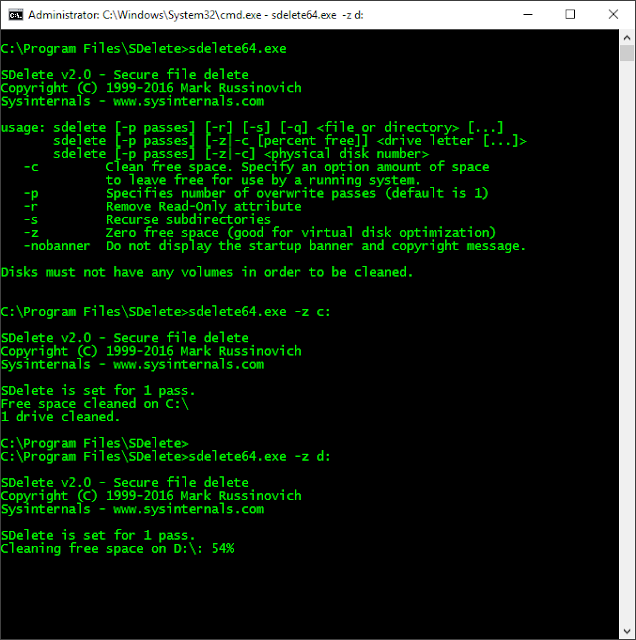 Lastly I run the SDELETE utility from a Command shell launched as an Administrator (Start -> Search for CMD.EXE -> Right Click on cmd.exe in search results -> Run as Administrator). I use the "-z" option for "Zero free space (good for virtual disk optimization)" and launch the 64-bit version SDELETE64.EXE included in the downloaded zip file since I am using 64-bit Windows 10. I do this for every NTFS drive on my Windows VM, C: and D: drives in the following example. to leave free for use by a running system. Disks must not have any volumes in order to be cleaned. Once SDELETE is complete, shut down your Windows VM appliance and proceed to compacting the virtual disks described below in section 5. 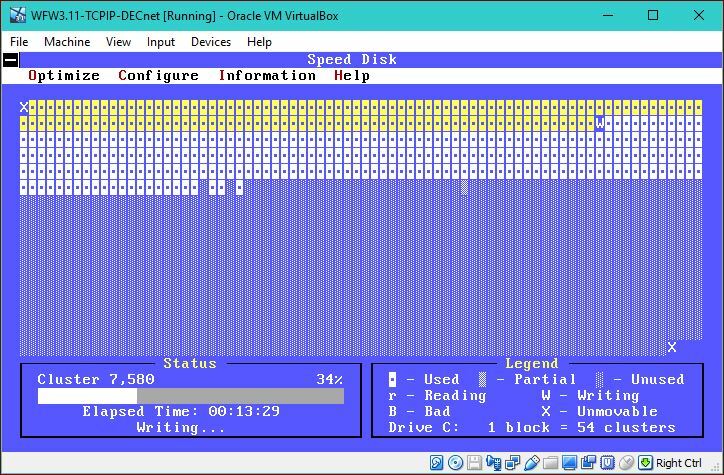 For my MS DOS and DOS-based Windows 3.x virtual machines, I use the classic Norton Utilities SPEEDISK and WIPEINFO applications to zerofree usused disk space. Norton Utilities 8.0 for DOS and Windows 3.1 is available from many abandonware archives including here. As soon as "Starting DOS" appears on booting up, press F5 to bypass processing of the startup files CONFIG.SYS and AUTOEXEC.BAT and get to directly to the DOS prompt. CD to the directory where Norton Utilities is installed (typically C:\NU) and run SPEEDISK with "Full with File Re-Order" optimization option for directories and files. Then Run WIPEINFO to zero out unusued disk space. A note of caution: MAKE SURE "Wipe unused areas only" IS CHECKED; OTHERWISE ALL DATA ON THE DRIVE WILL BE LOST! Here are a couple of screenshots of WIPEINFO in action. When complete, power the VM off. The virtual hard drive is ready for compaction. For defragmenting, I also sometimes use the PC Tools 2.0 Optimizer utility from "PC Tools - WinShield 2.0" group installed with PC Tools 2.0 for Windows. 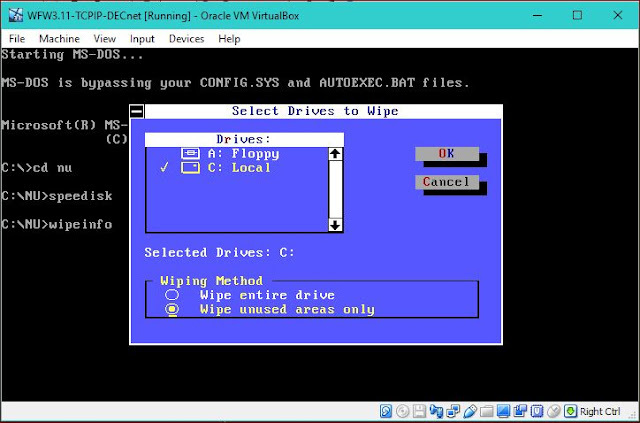 Once the unused space on the virtual hard disks has been zeroed out, Shut down the Virtual Machine, power it off completely, and use the Oracle VirtualBox "vboxmanage" tool with the "modifyhd --compact" command on your VDI format virtual hard disk to compact it. You can then reconfigure your virtual machine to use the VDI format virtual hard-disk file and not use your old vmdk or other format virtual hard disk file any more. As an example of what the virtual disk compacting procedure achieves, here are the size of the virtual disks before and after compacting of the Linux CentOS 6 VM we ran zerofree on in section 1. The system disk size came down by 6 Gigabytes, from 20GB to 14GB, not a small number. I run a VAXserver 3900 and a VAX-11/780 using the SIMH simulator on Linux hosts. Both VAXen run OpenVMS VAX 7.3. There is no virtual disk compaction tool included with SIMH VAX emulator. However, with the goal of minimizing tarball sizes while taking backups of the OpenVMS systems, I wrote and compiled the following tiny C program which creates a file ZEROFILE.ZERO in the current directory, occupying all available free space on the current disk. Run the program below on every disk drive, deleting ZEROFILE.ZERO when complete on each drive. This created file must be deleted before the virtual VAXen are shutdown and their SIMH Virtual Machine directory etc. backed up. After zeroing out empty disk space on my OpenVMS VAX disks, I did see some impact on the tarball size when I backed up the virtual SIMH VAX to a tar-gzipped archive. The archive size went down from 1,149,655,119 bytes to 1,038,719,403 bytes. 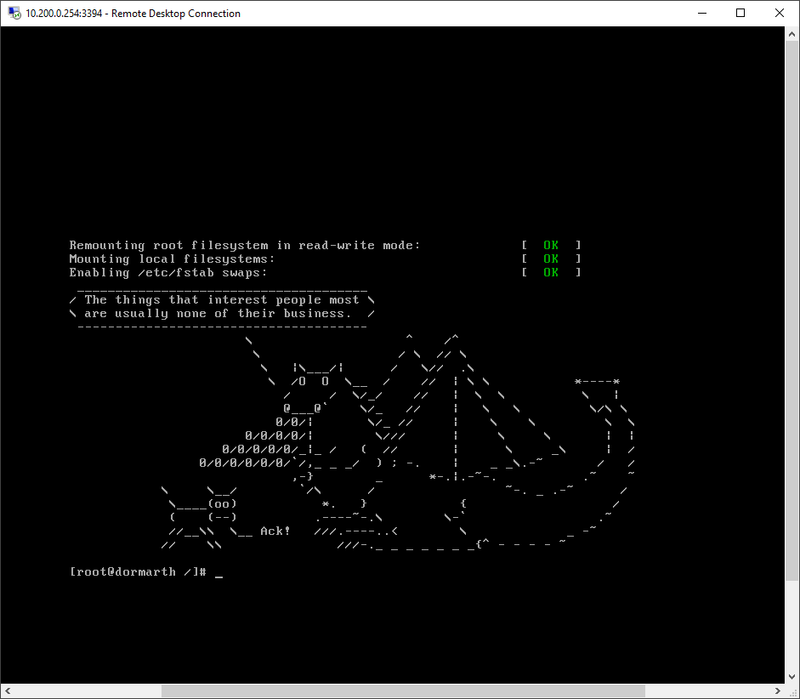 If you want to try ZEROFILE.EXE yourself, download the C source and VAX executable from the FAL SERVER area on my VAXserver 3900 node QCOCAL. A generic approach to zeroing out unused disk space on all Unix-like systems is to simply use the /dev/zero device to read from and dump into a file to fill up unused space, and then delete the file. 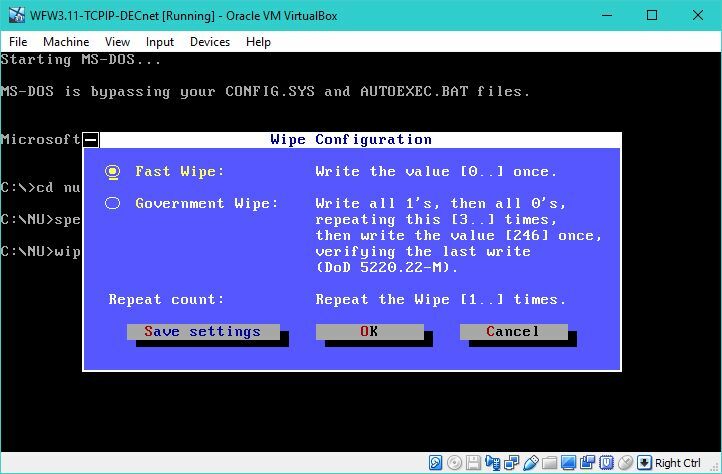 This method also has the advantage of not bringing the virtual machine down, it can be done on a live system. I use this approach to zero out unused disk space on my Sophos UTM and pfSense virtual machines.